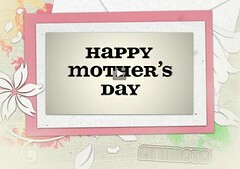 Animoto has a handy option for creating a customized Mother’s Day greeting. Upload your photos, pick some music – or maybe record your own greeting as and upload that as the audio. Finally select the special Mother’s Day greeting option. Your video will appear in a pretty frame and have it’s own URL. Send that off to Mom for her own personalized video! Previous Previous post: I will work for chocolate!